When I bought this house last year my life felt like a rollercoaster. I had been separated and divorced for three years, dated, had my heart broken, and turned inside out, cried way too many tears, overthought way too many things, lost old friends, gained new friends, found new love, and was in desperate need of some direction and normalcy. It's funny but when you move your home and go through a divorce there are so many things that change. Not just your partner and your friends, your family, your doctor, your dentist, but your local supermarket changes, and your every day Starbucks changes. Your go-to gas station and your favorite breakfast place. It's so much change at once that it can feel overwhelming and chaotic, even for someone who actually welcomes change. Just the smell of Costco can send you into a tizzy of what life was like way back then, when the kids were little and you thought you were happy. But I believe, the key to getting through the change is recognizing every step and allowing yourself to feel every single emotion. Good and bad. Allowing yourself to cry, question your choices, rethink things, and grow. My kids were going back and forth every couple of days and I wasn't use to days without them. I had never had a nanny or even been without them for more than 2 days so it was quite honestly, horrifying. At the beginning I would just cry and pace around my house and feel guilty for wanting a divorce because I couldn't see them everyday, but I knew that wasn't healthy for me to be sobbing every week. I had to put my brain to work and focus my energy elsewhere. I have always like changing my own homes and I thought a home renovation would be something that could take me out of my own house and keep me busy on my days without them. And well, well well ...... it has kept me very busy. When I first started this I thought I'll pick out some paint, tile, nice wood floors, knock down some walls, find some 1930s fixtures, ya know .... make it all pretttttty inside. I have decorated my other homes and done minor work and remodeled to an extent, but start to finish, top to bottom, is a whole different game! Before you get to pick tile or paint or furniture or fixtures you have to get plans and before you have to get plans you have to get as-builts. And before you get as-builts you have to know who to call to get freaking as-builts. And if you aren't engaged to an architect you probably have never even heard of as-builts! Basically, you have to get drawings of the house before you get drawings of your project! And that ain't cheap. The as-builts alone cost about $3,000. My house is 96 years old so there were no plans with the city. And let me tell you how long each person takes to complete their task. About a month! I know. When I started this project it was Christmas of 2017 so we were out a month at least just waiting on everyone to get back from vacation. And to get my architectural drawings .... Let me tell you ... I live with an architect and I still had to wait in line! (At least they were free though lol). So after we got the as-builts and the plans and the revised plans and the further revised plans it was then time to call 1200 people to actually bid and complete the work. I'm acting as my own GC so I printed out some developer business cards and headed over to every tile store, lumbar yard, and stone yard in LA to get my trade pricing. I also applied to every website online to do the same. Robert is an architect and a GC with his own company, but being the strong headed girl I am I really wanted to prove to myself that I could figure this out and do it on my own before asking for his help or anyone else's help. It's truly my strength ... and my weakness. So as it stands today, I have completed my as-builts and my plans and hired a dozen people. I have demoed all three bathrooms, the kitchen, the yard, the garage, the shed, and every floor that isn't original hardwood. 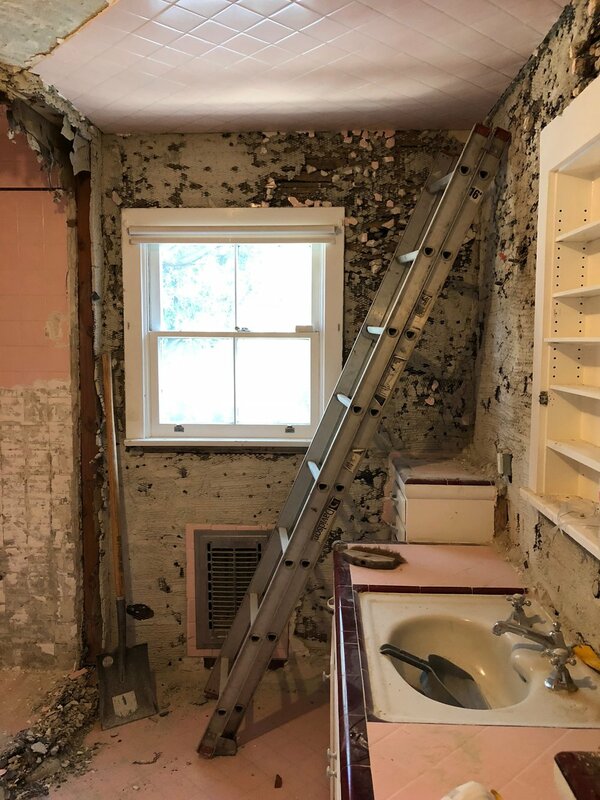 I have removed every piece of tile that was original and not original and I have kept every good piece of original tile that will be reincorporated. I am having someone re-frame a doorway on Thursday, having someone help me refinish every original door and window in the house and fix every 95 year old latch, pull, and hinge so they can be salvaged and made perfect again. I have spent 12 hours (no joke) picking light fixtures and have ordered the kitchen counters. I have removed the asbestos, a dead possum, a dead rat, a dead bird, a load of roaches, termites, and too many spiders to even count. This is the Kitchen and the dining room. The dining room was originally a patio that was enclosed and over time someone added a travertine floor that flowed into the kitchen. Actually , the man that layed this travertine floor found my blog and wrote to me. He laid the floor himself and he did an incredible job. Side note: How crazy is it that he found my blog! Unfortunately it didn't match the style I was going for as I am planning to do all wood so it matches throughout so we had to remove it all. This was a tough decision as this raised the budget significantly and the cement patio is still very raised so the floor will not be completely even and I may have to go a different direction with the wood just in this room. Even so, I think it will make the house flow better and I think it will be appreciated by the next owner. The travertine was also removed in the kitchen and I am widening the door frame on the right and re-framing it so it's an arch like the rest of the house. I wanted to take down the whole wall and float an island into the other room, but it wasn't cost effective and it felt too modern. There is a supporting beam in that wall and there were issues with moving it etc. so I'm hoping by widening the entry it will visually look more open while still feeling like it was built in 1927. We removed all the tile as well and it will be replaced with white tile to match the new white walls and white counters. The cabinets will be a pretty sage color. This is my beloved pink bathroom. I cried when we removed the tile. While it looked beautiful in the picture it really was cracked and dated and dingy when it didn't have an Instagram filter over it and the shower was too dark and enclosed and it reminded me of a tanning booth. There are only two bedrooms upstairs and I just thought it was too much for the only other bathroom to be all pink so we removed it. I saved about 70 tiles that I will be incorporating back in though and I have kept the vanity as well as both mirrors and the bathtub. I'm really trying to bring the house up-to-date while still keeping the integrity of the original home. This bathroom took 3 days to gut with three guys. The craftsmanship was incredible. Every wall was covered in cement. 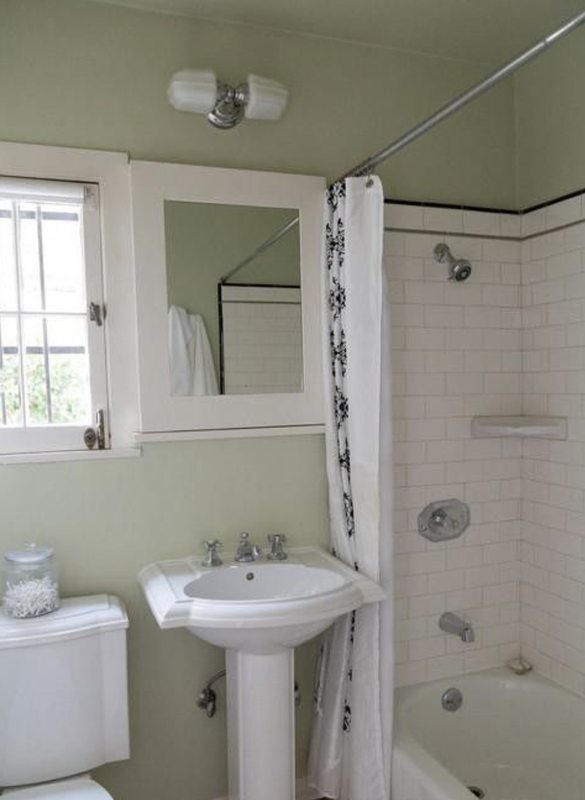 I am having someone reframe the shower so it's a square and I will enclose it with glass. This is the master bathroom upstairs which is a project in itself. There are so many walls in here and ad-ons and weird things happening. We removed the tile and the laminate and vanities and are about to remove the ceiling as well. I will save this all for another post though. P.S. There was so much mold in this room I had to wear a mask in order to even of in. So gross. This is the powder room downstairs. 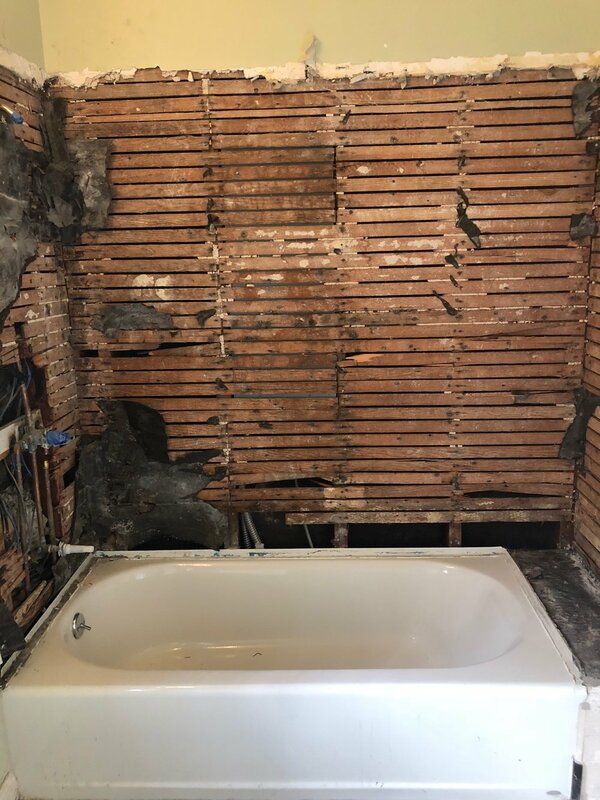 This bathroom was redone at some point and the subway tiles were uneven and the walls needed repair so we took it all down to the bare wood. There are some electrical issues in this wall so we are fixing it all this week and then plastering tomorrow. Yay! I removed the giant iron gates that closed off the dining room to the great room and I also chipped off the tile on the sides of the fireplace so we could have a more even up-to-date fireplace.